Samsung Display has again been rumored as the exclusive supplier of OLED panels for the 2017 iPhone, according to new claims made by sources in the Taiwan supply chain (via DigiTimes). Back in April, The Korea Herald reported that Samsung would supply Apple with OLED panels in 2017, furthering rumors from as early as January that Apple and Samsung were in talks for an OLED manufacturing partnership. 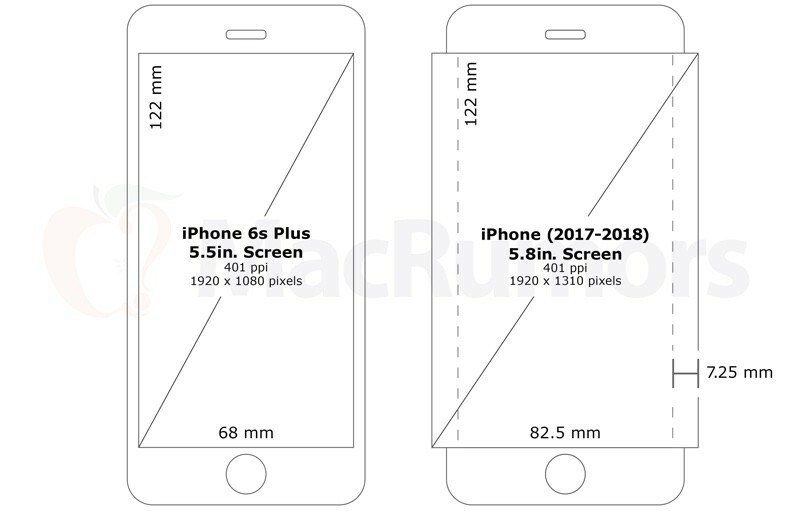 Next year's iPhone is said to come in 4.7-inch, 5.5-inch, and 5.8-inch sizes, with the last model believed to be the only iPhone with an OLED display. The OLED version's actual touch-sensitive screen real estate may in fact be closer to 5.5-inches, or possibly 5.1- and 5.2-inches, if the rumor of a curved display is true. Samsung's current estimates place the company at manufacturing 20 million units per month, according to the supply chain sources. The company's shipments of OLED units are estimated to reach 590 million by 2019. As for benefits, OLED screens can be brighter, clearer, and lead to more energy efficient iPhones. Samsung Display will become the exclusive supplier of AMOLED panels for use in Apple's new iPhone devices to be launched in 2017 and can supply 20 million units in maximum a month, according to Taiwan-based supply chain makers. In a separate DigiTimes report posted today, Wistron is believed to be a potential third partner for the manufacturing of the 2017 iPhone, following Foxconn and Pegatron. Wistron was previously rumored to be part of Apple's diversification in its supply chain this year, but it seems like the company was left out of iPhone 7 manufacturing. In the past, Wistron helped supply the iPhone 5c and iPhone SE. "Guys - you know that iPhone, the one that's so wide you have to operate it with two hands?" "Let's make it even wider!" All I want is a ~4.5" iPhone with flagship specs in a device around the size of the 5S. IMO that's the perfect size for a phone. I think they're going to make the edges wrap around to get rid of all the buttons and instead make them all touch based. They will also get rid of the mute switch like they did on the iPad. Unlike the S7 edge's which is purely for aesthetics, Apple will bring some functionality with their implementation. If they want a true touch screen phone with no buttons then they might as well go all out. I imagine there will be a huge uproar with this (along with the removal of the home button), similar to the removal of the headphone jack this year. Good news for Samsung on landing a large order. I am sure their marketing team is drinking late into the night. I think some partisans around here are going to have a meltdown! Who in their right mind thinks that curved screen is half way decent? As with all features in non-Apple tech, almost none of us appreciates it now: "gimmick", "stupid", "99% don't need..."
But when Apple rolls it out in Apple tech, almost all of us will gush passionate love for it: "shut up and take my money", "best iPhone ever", "how did we ever get by without..."
In the time between now and then, the disdain will shift to variations of a "wait & see" sentiment... and then increasingly positive as rumors pile up implying Apple is actually going to embrace it. * Late rumors increasingly confirming adoption: "it's growing on me" & "...but Apple will do it right"
* Apple launches it: "shut up and take my money"
Slug in some other competitor product feature not in the iPhone for the next round of early rumors, rinse & repeat. See phones with bigger screens, NFC, etc for prior examples. Personally, after 3 rounds of refining iPhone 6, anything of consequence that makes this phone tangibly different is probably going to jack up our enthusiasm to crazy levels. I suspect we're all well beyond itching for something- anything- that seems 'next big thing' from Apple and this seems to be the most obvious candidate to focus that enthusiasm. C'mon Apple, I for one am fed up with the smaller models missing out on headline features. I'll believe it when I see it. 9 more months. What shall we call the newborn? iPhone is starting to look more like micro iPad mini than a phone..
You will need two hands to hold this one and cargo pockets..